Inspired by Željko‘s Pacman doodle automation using Watir, I decided to give Sikuli a shot and see if I could automate it. 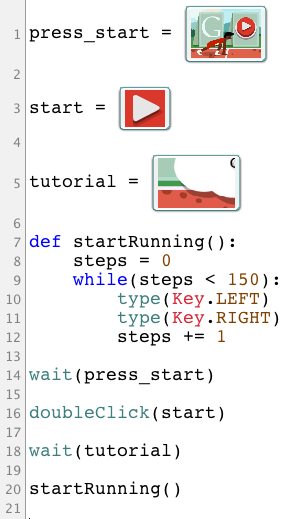 The following script successfully plays the Hurdles game but doesn’t jump (yet). It finishes the game with two stars in 10.8 seconds (running on my machine, that is). It seems like Sikuli takes too long to identify the objects, so if we add any find() or exists() calls in-between steps, the scripts performs really bad and finishes in about 50 seconds instead of just 10.8.